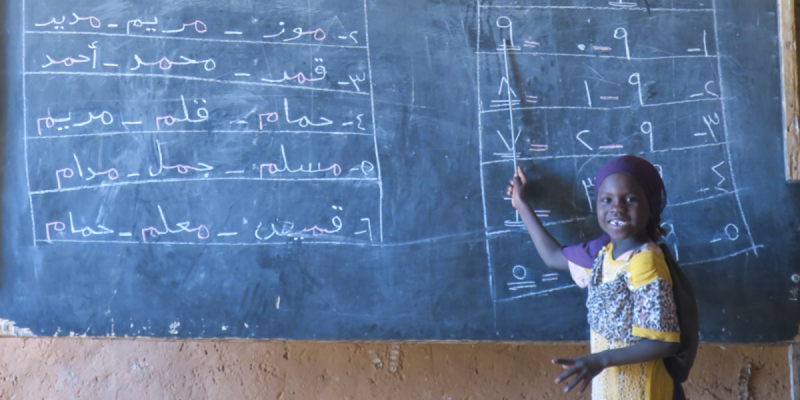 A young student learning at a primary school in Iridimi Refugee Camp. Noha was five or six when she left Sudan with her family fleeing mass atrocities committed by the Sudanese Government and rebel groups. They walked through warplanes that circled and indiscriminately shot at civilians as they fled for their lives. Noha and her family are among the 300,000 refugees that came to eastern Chad from the Darfur region of Sudan since 2003. Though Noha was able to flee violence and persecution, she, and families like hers, living in twelve camps throughout eastern Chad still face many challenges. Chad is one of the poorest countries in the world, children and young people continue to struggle to gain access to quality education. UNHCR in Chad reports that of 182,000 school age refugee children, almost 78,000 are enrolled in school, about 43 percent – while remaining 57 percent are out of school. Chronic budget cuts and donor fatigue further contribute to challenges as families that rely on their children for additional income must choose between sending them to school or paying for the family’s basic needs. Inadequate infrastructure, lack of teachers, as well as insufficient textbooks and minimal professional development opportunities are also some of the challenges refugees face in accessing a quality education. Rooted in the Jesuit commitment to education, Jesuit Refugee Service began operating in chad in 2006, and as of early 2017, oversees most education programs in eastern Chad. JRS/USA’s report A Worthy Investment: Access to Education for Sudanese Refugees in Chad, provides an overview of the work we’ve done, challenges refugees continue to face, and policy recommendations that could improve conditions for children like Noha.